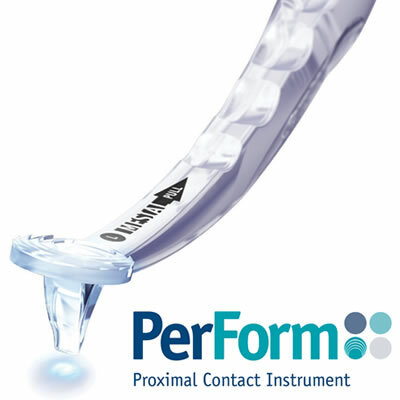 The PerForm Proximal Contact Instrument from Garrison Dental Solutions gives the clinician control over the formation of interproximal contacts on posterior composite restorations. Regardless of the matrix system used, the PerForm's simple push/pull technique holds the matrix and composite material in the ideal position. The curing light is placed directly on the unique Fresnel lens that aids in directing the light deep into the proximal box. When cured, PerForm is easily removed and the restoration is completed resulting in perfectly formed tight contacts. PerForm comes in a set with instruments for both large and small preparations. Each double ended instrument has a mesial contact former and distal contact former.